Since our little nest has been deemed “safe” for puppy’s arrival, it’s now time to start some additional puppy parenthood preparation.There is excitement building in our house and the anticipation seems to be growing everyday. With so many dogs in the house, keeping the puppy safe from the other girls is of utmost importance. Now even though all my girls are great, they all have different personalities and little temperaments can get pushed. This is why baby gates are so important, they provide the perfect atmosphere. 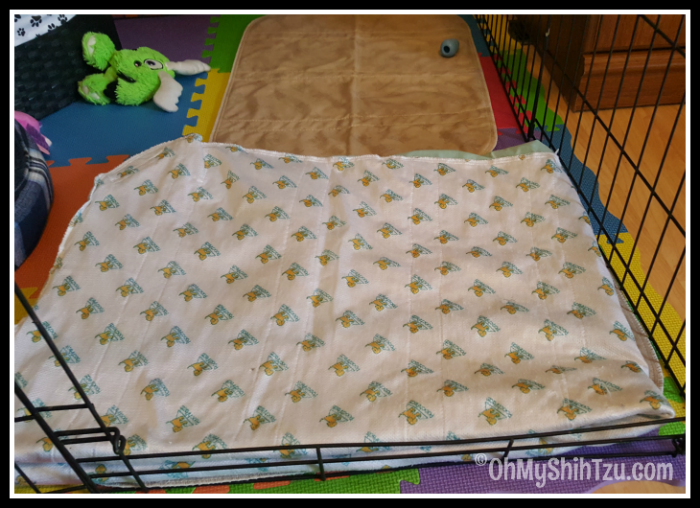 Using a playpen and/or x-pen is one of the best ways to create puppy’s own “space” to be able to play and sleep comfortably during the daytime (or night if he doesn’t sleep with you). In our post Nesting Instinct I introduced the playpen that was set up in my office, but the pen itself did not always look like this. Since we have had this xpen for many years it was slightly rusted, which I definitely did not want in the house. So with a little sanding and a can of Rustoleum we got it looking brand new again! I just really love his little office playpen. Since laminate flooring can be a little slippery I wanted to make sure his area was safe so I made a trip to Buy Buy Baby and purchased these great little linked mats. 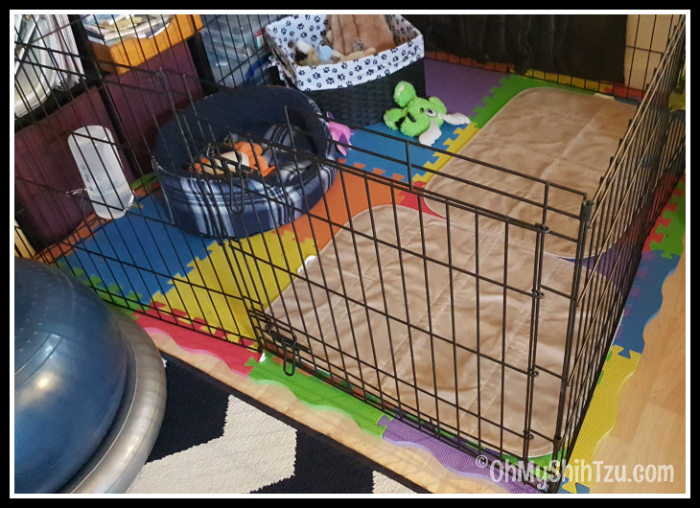 One thing to remember when setting up your puppy’s area is to not exclude your puppy from your daily life. Place the playpen in a high traffic area or a place that you’ll know they will have constant companion ship. Shih Tzus are social little dogs and do not do well being isolated. If you didn’t notice, our puppy pads look a little different from normal paper pads. I use Pooch Pads! What are Pooch Pads? Well they are a super absorbent, re-useable pad made with micro-fine fibers and odor inhibiting technology. We have used them for years. 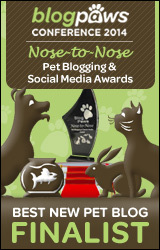 The first time we used them was with JoeJo are senior Shih Tzu who became incontinent. What I love about Pooch Pads is that they are easy to clean. All I do is throw them in the washer with warm or hot water, detergent, a little bit of bleach and then dry on the perm-press cycle. Viola! They come out great. The company says they can be used approximately 300 times. Talk about raising a green dog! They also come in two colors, a tan & white! I strongly believe collars are a must, especially for training. We’ll discuss why I think they are important when we start the puppy’s training. But when choosing a collar make sure that the collar is light weight, has no sharp edges and is loose enough to slip 2 fingers between the collar and the pups neck. If you plan on leaving the collar on 24/7 make sure you are checking the collar everyday for a proper fit. Be sure to start off by having the collar on only an hour at a time and then increasing that amount every few days or so until the pup becomes accustomed to having the collar on. For walks though I prefer using harnesses for Shih Tzus and pretty much all dogs either large or small. I belive they are the safest in protecting the dog’s neck from any accidental injury. They also provide a higher level of protection for keeping your puppy on lead as many dogs can easily slip out of a collar. When it comes to leads, a 6 foot lead is the best. They keep a perfect amount of distance between you and your dog when on walks or even potty breaks. If you are thinking about getting a retractable leash, I’m just here to tell you DON’T DO IT!!! Not only can they be a danger to you but also to your dog, Dr. Karen Becker gives 10 Reasons Not to Use Retractable Leashes . Retractable leashes also teach a dog to pull and not walk nicely at your side. To make sure your puppy maintains their cute appearance you will definitely need a good brush, comb & shampoo. Because grooming is so important with Shih Tzu’s I have two diaper baskets that I keep all the supplies in. 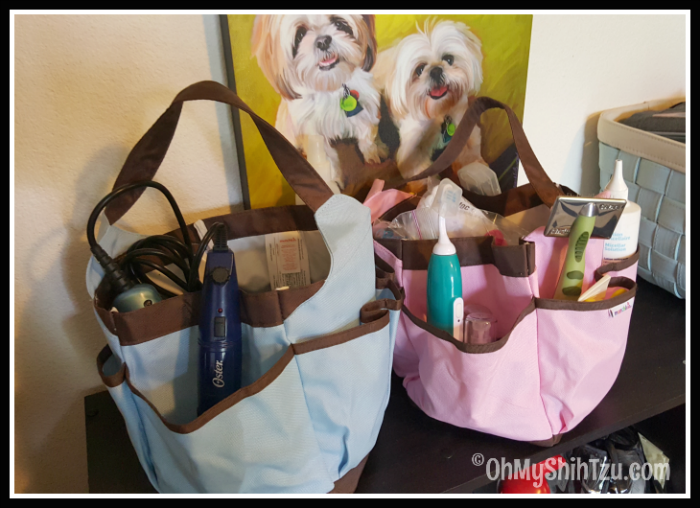 The pink basket contains all supplies for daily grooming, brushes, combs, sprays, bows, etc. The blue basket contains everything for major grooming, several hair clippers, toe nail trimmers. The time is almost here!! We are awaiting the arrival of the little man and for puppy parenthood to begin. Are you also waiting for the arrival for a new puppy? I have never heard of re-usable puppy pads! That’s great! Although I don’t know if I would ever be able to handle another puppy in my life, I’m excited for those that are! I love those puppy pads. A great way to keep from increasing the waste. I have a friend who uses them too. You’re a better woman than I am – I had a crate and some hand me downs from Harley and Leo and BAM! I was ready!